The following are a series of steps for interpreting those Tarot cards that have scenes or pictures. Use as many steps as you want and in any order, although I recommend beginning with the first four steps. By emphasizing particular steps you create your own personal style. Draw at least one card a day (many people prefer using a basic three-card spread), and go through several of the steps below, writing down your insights in a notebook. The next day make notes about what actually happened. For important dates (when you began a job, moved, or met a significant other) continue adding comments as your insights develop over the years. In three years, drawing only one card per day, each card will have appeared 10 to 20 times. 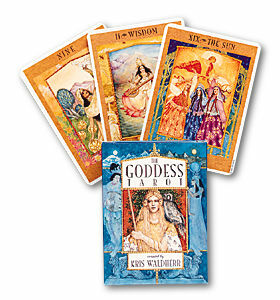 If you balance personal notes with observations of readings for others you will one day have your own book on the Tarot. Say the name of the card aloud. Describe what SEEM TO BE the emotions and feelings of the figures on the card and the mood and atmosphere of the environment. Repeat this description in the first person, present tense. Make up a spontaneous story or fairy tale about what is happening in the card. Begin "Once upon a time..." or "What if..." Repeat in the first person, present tense, etc. Notice any impressions, ideas, or thoughts that come up while doing the above. Ask your client (or yourself) how these are relevant, then LET THEM GO. Don't become emotionally attached to any of your ideas or opinions as being "right." These may be psychic insights, metaphors for a deeper meaning, or your own stuff (experience will make the distinction clearer). If reading for another DON'T MAKE JUDGMENTS about whether something is good or bad (see Step 15). Do any expressions, sayings or clich? come to mind as you look at the image on the card? [I.e., "out in the cold" for the Five of Pentacles. "Stabbed in the back" or "pinned down" for the Ten of Swords.] Proverbs can be especially insightful. How do these relate to the situation? Imagine the entire range of card meanings as stretching from most problematic to most beneficial. Give an example from each extreme. See this range of meanings as on a dial or continuum. Have your client (or yourself) move their hand along the continuum until finding where they are NOW. Next determine where they WANT TO BE along the continuum. Is there another card in the spread that supports that? [Note: it is preferable to see cards as "problematic" rather than "bad," and "beneficial" or "helpful" rather than "good."]. If applicable, is this card MODIFIED (strengthened, opposed, etc.) by any other cards in the spread or by being REVERSED? Note repetitions of suit, number, color, shape, figures, detail, theme, etc. among all the cards. What does the card (or the figures on the card) have to teach you? If in doubt, ask these figures. Speak the first response that comes to mind. Again, a person should only do this for themselves. As the reader you should guide the client/querant through this process. What are the qualities that you (the querant) see in the card that YOU would most like to develop in YOURSELF? (Note: every card contains something of value.) Name those qualities. Turn them into a statement affirming that you already have and are using those qualities in your life right now. The querant should always do this, rather than the reader imposing his or her own opinions on the querant. The cards respond to your intentions and so will work whether you use reversed cards or not. For years I did not read upside-down cards, but turned them all upright, and was perfectly happy doing so. For short readings at fairs I still often read the cards upright. However, I have come to find reversals very significant, only not according to the fixed interpretations in books, which are often negative and judgmental. I think beginners can benefit by using only upright cards until they know and understand the fundamental meanings and subtle nuances of the cards. The energy normally described by the card may be blocked, repressed, denied, or resisted. This could be entirely appropriate and healthy, or not, which the person themselves may be able to tell you. There could be a tendency to project such denied material onto others. There might be hesitation, or an external delay (especially when many cards are reversed indicating that an impending change could take longer than expected). The person could be overturning, getting out from under, breaking free of, or turning away from the condition pictured in the upright position. It could show a bumpy road. Energy is not flowing as smoothly or automatically as it would otherwise. This may require a conscious commitment, and an extra, determined effort to get whatever the card represents upright -- if that is what is desired. There could be a trickster aspect to the card. Perhaps a sense of humor is required, or not taking the situation too seriously. There could be a turn around or upset in the circumstances described, that may ultimately be for one's own good or growth. While adding "no" or "not" before the standard upright interpretation can occasionally be helpful, take care that this does not lead to a judgmental, overly deterministic, or negative approach. Practice this with a light touch. Several, or all, of the above options may be functioning in any one reversed card. We are not talking about simple solutions here. Look to see if a particular point of view is supported by other cards. For instance, the Hanged Man could support the idea of delay. Ask the client what seems most likely. Make a list of other reversed card concepts until you find ones that make the most sense. Look for what will add the greatest depth and insight to your readings. 1. 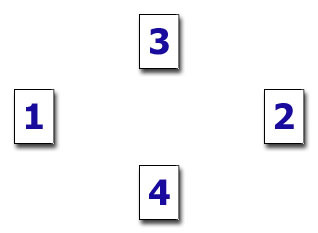 This classical three-cards-spread can briefly point out the development of issues. The present situation, also representing the questioner. Circumstances in the past that led to the present situation. 2. The cross can help to find your direction in crises or complex situations. This is what it is all about, the core of the issue. This is not important now, you should not do this. This is very important now, this you should do. It will lead to this. 3. 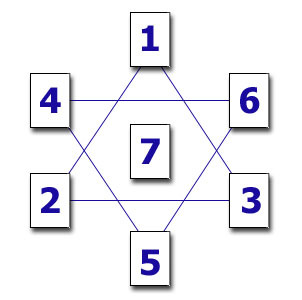 The star is a good spread if you wish to receive more clarity and insight in a problem. What influences the matter in a positive way. What influences the matter in a negative way. 4. The magical spread of the gypsie can be used to get an overview of the present situation of a person. This is the person in the present situation and mood. This is the impression you make in the outside world. This is what you hide behind that appearance (consciously or unconsciously). This is what you want to do, your actions. This is how you feel and what you will reach. What comes afterwards, the future. This is what that will mean to you. 5. The Celtic cross is the most famous spread. You can use it in most situations. I give you an extensive version of the Celtic cross. First lay out these eleven cards. This represents what it is really about, what you feel deep inside. This covers the heart or intensifies the matter. The past (in relation to the question). That which supports you or you lean on. How you think about the issue. Personal problem, your point of view of it. The point of view of those around you. 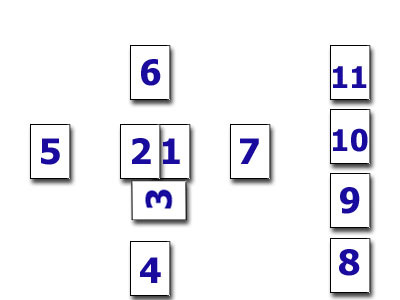 After that turn over the pile with the left cards, take of the first five cards and lay them out from the right to the left. Now these five cards tell - from the right to the left - the story of how things will develop themselves. 6. The fifteen-cards-spread is very helpful in pointing out trends, psychological and karmic influences and future developments. Try it! This spread makes more use of the relationships of the cards to one another, so a card may be well- or ill-dignified depending on the influence of the card to the left or right of it. Represents the questioner or the issue. 6- 10 - 14. Indicate the psychological basis of the issue; they can assist in deciding what may be necessary. 7- 11 - 15. Show forces behind one's control, destiny or karma. 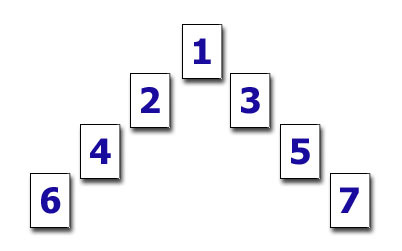 13 - 9 - 5. And 4 - 8 - 12. Show possibilities for the future. If the left and right upper cards complement each other, you can look at them as one development. If the left and right upper cards are in conflict, then the right upper cards show the future if the questioner does not change his present attitude, and the left upper cards point out a possible future if the person does change his direction.